It should come as no surprise that a company with mushroom in its name knows just about everything there is to know about the little tasty fungus. And when it comes to growing them, Monterey Mushrooms has the process down to a science…an exact science that is. 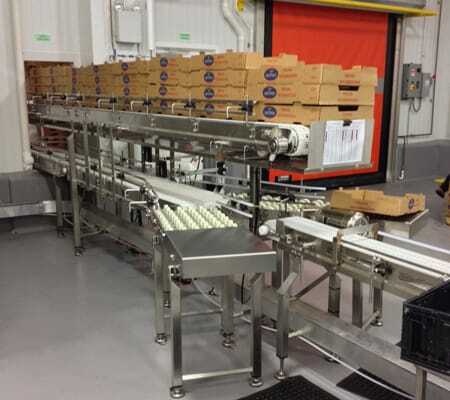 Everyday, thousands of pounds of mushrooms are picked and packaged from Monterey Mushroom’s Loudon, Tennessee, facility, and playing a critical role in that process is a new sanitary conveyor system from Dorner Mfg. 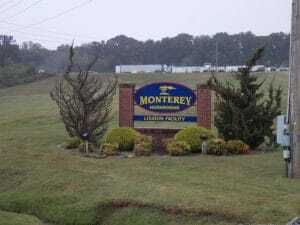 With the help of Dorner, Monterey Mushrooms is able to ship product daily throughout the southeastern part of the United States. Monterey Mushrooms is a second generation, family-owned and operated agribusiness that began in Royal Oaks, California, in 1971. The company bills itself as the country’s largest and only national marketer of fresh mushrooms for sale to supermarkets, foodservice and ingredient manufacture operations. Today, the company boasts 10 growing farms throughout North America. What makes Monterey unique is that it’s vertically integrated and able to control all aspects of mushroom production from seed to customer/consumer. But before even one mushroom is packed, it needs to be grown, and that’s where the science comes in. The company grows all of its mushrooms, from white, portabella, organic, to a variety of specialty mushrooms, indoors in one of 47 growing rooms. These rooms, measuring about 90 feet long by 30 feet wide, are filled with six levels of growing trays. Monterey follows a five-step process to grow its mushrooms. Phase I involves growing its own compost. Straw bedding from Kentucky horse farms, protein supplements, gypsum and water are mixed together and kept outdoors for six days to be biochemically converted, by the tremendous heat naturally evolved, into the preliminary food source for the mushroom. Next, the compost is mixed with vegetable oil and more water, then moved indoors and filled into wooden trays before the next phase starts. The compost is pasteurized to free it of weed molds and insects, and then cooled down to room temperature so the mushroom spawn can be added. This phase requires six days to accomplish. After the spawn has been planted, it will grow in 13 days to completely cover the compost that now serves as a food source. A mixture of peat moss, limestone and water is applied to the top of the tray. The spawn starts to grow in the mixture and, in a few days, the environment is carefully controlled to encourage the mushrooms to reach maturity. 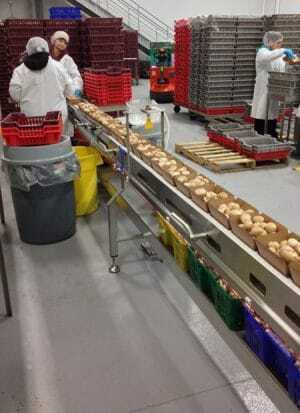 The mushrooms are then picked, according to size and maturity, and hand sorted into baskets. The compost is used for three growing cycles before being sold to local organizations. 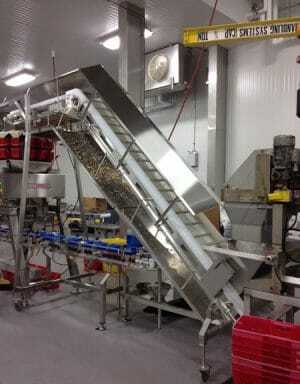 The entire process takes about seven to eight weeks from first making compost to picking mushrooms. 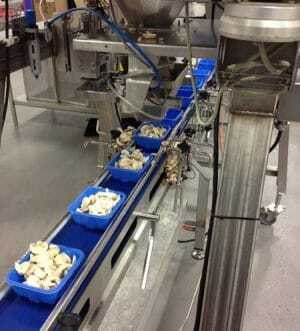 Packaging thousands of pounds of mushrooms every day is no small feat. To aide in that process, the company embarked on a renovation plan two years ago to add new dry storage space, new cooler and additional docks, as well as redesigning its packaging lines for improved efficiencies. As part of the new packaging lines, Monterey Mushrooms selected a mix of nearly 30 AquaPruf and AquaGard sanitary conveyors from Dorner. 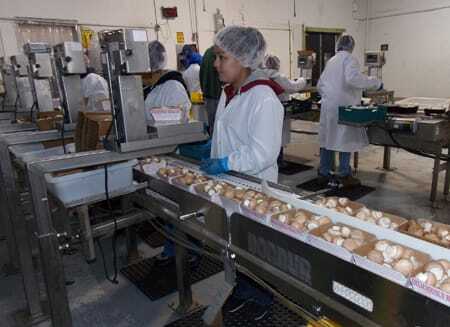 “I’ve always known Dorner was pretty top-notch, good quality conveyors that we’ve used in the past, so choosing to continue going with them was an easy decision,” said David Redd, engineering manager, Monterey Mushrooms. sanitation that can be accomplished through wipe downs and other techniques. Redd worked with Steve Averdick from Belcorp, Inc., a Cincinnati, Ohio-based distributor of automated packaging systems, to help design a conveyor system to meet his needs. Throughout the course of a year, Averdick worked closely with Redd and Dorner in designing a system to streamline Monterey’s packaging lines to improve efficiencies. He recommended both Dorner’s AquaPruf and AquaGard conveyors to best move Monterey’s mushrooms. The platforms are designed for the food and medical industries, and meet various BISSC, NSF, USDA and FDA regulations for safe and effective operation. Dorner’s AquaPruf platform provides the highest sanitation level, and the fastest cleaning times – which give Monterey more time for production and higher return-on-investment. The AquaGard platform of stainless steel conveyors offer flexibility for a wide variety of products and applications, while increasing throughput and reducing product loss. Dorner’s AquaPruf and AquaGard platforms can be completely disassembled for cleaning, by one person, in less than 90 seconds. The entire cleaning process takes just a few minutes to complete. Monterey picks and packs mushrooms sometimes as long as 16 hours a day. When packing is finished for the day, a sanitation crew cleans and sterilizes every conveyor, along with the rest of the facility.